Our long-standing, widely-known commitment to a cleaner, and more sustainable future is the reason why environmentally concerned governments and, businesses and hospitals choose Hako for their cleaning needs. From prototyping all the way to product use, Hako designs their products to make as little negative impact on the environment as possible. Environmental implications are factored into the digital concepts, with waste disposal and recycling playing a major factor in the final product design. During production, vigorous testing ensures product features are not compromised over the lifetime of all our machines. And after winning various environmental and sustainability awards like the Stormam Cultural Foundation award, it’s easy to see why Hako is a step above the rest when creating products that’ll make our world a better one. Minimising environmental impact without sacrificing quality and machine longevity. We believe product longevity should be a major part of sustainable design. Which is why after choosing Hako, you’ll find yourself buying less replacement parts, saving more time, and servicing your machines less – so your staff can focus on keeping your parks, hallways and communal areas clean. 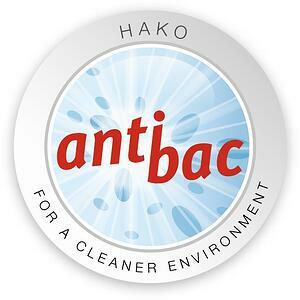 Increase hygiene and safety standards with Hako’s Anti-bacterial tanks. Certified to ISO22196, the antibacterial tank coating provides considerably better hygienic conditions in the tank, as well as ensuring a reduction in the consumption of disinfectants when cleaning the tank. 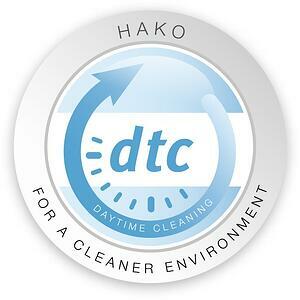 Hako’s Day Time Cleaning uses battery technology in our walk behind scrubber-driers, allowing interim charging within 20-30 minutes. 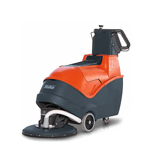 This technology enables clenaing during the day by extending scrubbing uptime. This guarantees longer periods of operation, reduced unproductive downtimes and an improved standard of hygiene. 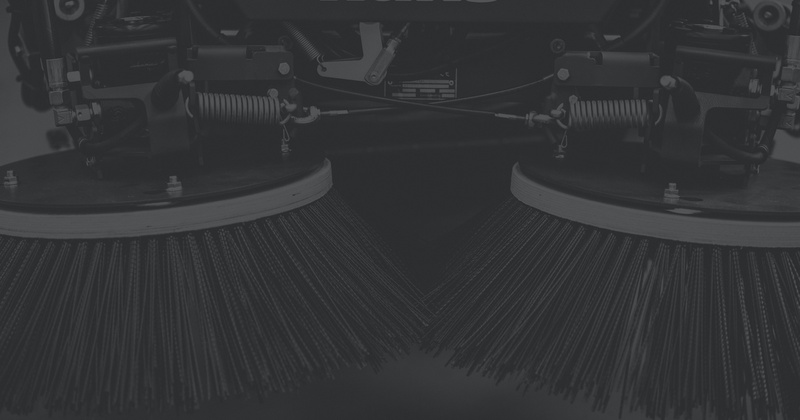 Reduce your environmental waste by up to 50% and spend less on replacements because of our Patented Aqua Control Brush System which lasts up to 300 hours of cleaning. 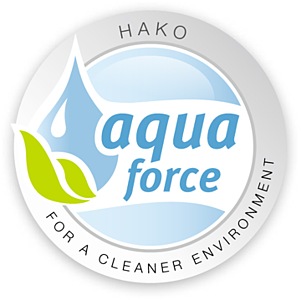 Our chemical-free Aqua Force Technology allows your business to become more sustainable by eliminating harmful chemicals by using long, well established proven technology of demineralised water for cleaning, unique to Hako Scrubmaster scrubbers while giving your floors a better, longer lasting clean. We've been in the commercial equipment cleaning game since Christmas Eve of 1948. 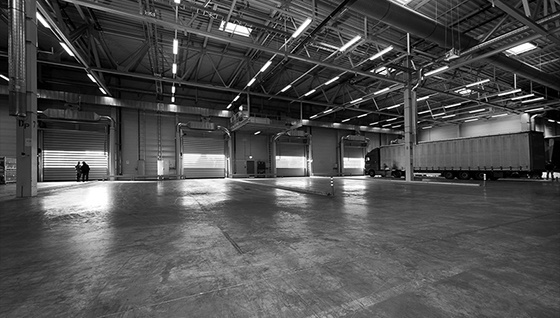 That's nearly 70 years of experience you can trust when you need high-performing, high-quality, and low environmental impact cleaning machines. Our Integrated Environmental Cleaning System has been perfected over the years to maintain high hygiene and safety standards, reduce energy and water consumption, and improve cleaning performance. With made-to-measure dosage and filling systems, Aqua Force technology and speed dependent control systems, you waste less water and use little-to-no harsh chemical detergents when keeping your cities, hospitals, and business facilities clean. With the use of deminieralised water, surfaces remain cleaner for longer as dirt particles aren't given the opportunity to attach themselves to the residues of tensides, soaps and detergents. By removing up to 99.9% of particles in exhaust emissions, it means in the future, when environmental restrictions and pollution is predicted to be at record levels, you won't have to worry about upgrading your machines to reduce carbon emissions because of our advanced exhaust filter systems. Or step into our equipment to further reduce emissions, by using our high-performance battery systems. From end to finish. From conceptualisation to disposal. We look at the big picture, and we understand that not only do you want a machine that lasts longer than its alternatives, you also don't want to burden the environment by constantly replacing machines that can't be disposed in an eco-friendly manner. We proved that it's possible to eliminate dirt and dust without polluting the airways. By using our special filter systems that stops up to 99.9% of the dust our sweepers pick up from entering the airways, you're keeping those with allergies, asthma, and other dust related issues safe. With every new technology we make, and every new product we release, we're always looking for new ways to make our business - and yours - more sustainable. 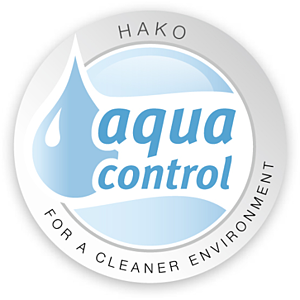 By choosing Hako, you’re choosing a better, cleaner, and greener future. Speak to one of our Application Specialists, anytime. If you have any questions, or you’d like a demonstration of one of our products, please fill in the form and one of our team will get in contact with you shortly.